For Nevada real estate owned by two or more persons as joint tenants or as community property with right of survivorship, the death of one co-owner means that his or her property rights are shared equally amongst the survivors, without the need for probate distribution. This transfer technically happens "as a function of law" when one owner dies. Even so, surviving co-owners must initiate the process by recording an affidavit of death, accompanied by a certified copy of the death certificate, to terminate all title to or interest in real property of each deceased joint tenant or the deceased spouse. 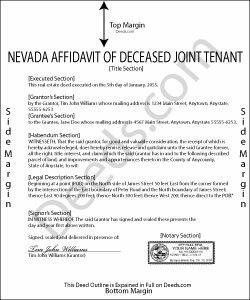 After the affidavit is recorded in the office of the recorder of the county or counties in which the real property is located, the deceased owner's rights are presumed to be terminated, and vested solely in the surviving joint tenant or spouse or vested jointly in the surviving joint tenants. The days and weeks following the death of a family member, friend, or business associate are often difficult, but timely recording of the affidavit of death is important. It preserves a clear chain of title, which makes future conveyances of the property less complicated. In addition, updated records ensure that property tax bills and assessments are sent to the correct recipients.